The new model of the brand New Britain. New Britain - watch company, which carries out the manual assembly of its watches in Switzerland. 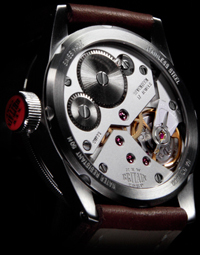 New Britain – watch company, which carries out the manual assembly of its watches in Switzerland. The main feature of the brand is the desire to create high-quality mechanical models at an affordable price. The technology, which released the company is represented in a circular housing with a diameter of 45 mm polished steel AISI316L. 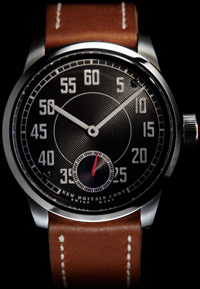 Black dial with circular design reminiscent of their treatment devices motorcycles 50s. Performance of 1:30 and 7:30 is the screws that serve to attach the dial. In “6:00” is placed a window with a red second hand, which is in harmony with the black dial. The model is equipped with the caliber Unitas 6498/1, which was developed with a special finish of the highest quality – blasting bridges, all rounded edges and polishing elements and the exclusive use of polished screws. The result is a unique hand-wound caliber that meets all certification standards COSC. Buy Watches by brand New Britain can be priced at $ 3200.